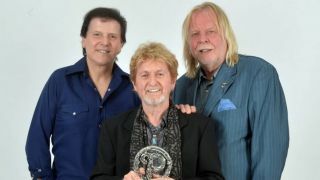 Former Yes trio Anderson Rabin Wakeman will play a 2nd date in London due to "overwhelming demand"
The former Yes members – Jon Anderson, Trevor Rabin and Rick Wakeman – will play at Hammersmith Eventim Apollo on March 18, in addition to the previously announced show at the same venue on March 19. It brings their tour up to 10 UK dates, with the trek kicking off in Cardiff on March 12 and wrapping up in Manchester on March 25. Tickets for the new London date go on sale at 10am on October 14 (Friday) via Myticket and Seetickets. Anderson Rabin Wakeman (ARW) previously revealed they would record new music in 2017, possibly in the format of multiple EPs. Anderson, who was named the 2016 Prog God at the Prog Magazine Awards, said: “We’ll probably release EPs, but we will wait until the new year to record them. For now, it’s putting on a show that works. “It’s gonna be great fun for us, and the fans. We just want to have a good time, re-creating the wonderful music of Yes over the years. ARW are currently on the road in North America. Is Do Not Disturb really going to be Van der Graaf Generator's final album? Yes Fragile Album Quiz: how well do you know their fourth studio album?